Louisville, KY (December 8, 2012) – Amy Staton, of Bath County, is the recipient of Kentucky Farm Bureau’s 2013 Women’s Educational Grant. The announcement was made at the organization’s 93rd annual meeting, held at the Galt House Hotel in Louisville. Amy Staton (left) received the 2013 Women’s Educational Grant at Kentucky Farm Bureau’s 93rd annual meeting in Louisville. 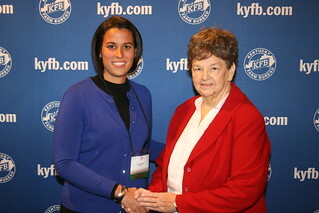 The award was presented by Phyllis Amyx, chair of the Kentucky Farm Bureau State Women’s Advisory Committee (right). The $1,500 Women’s Educational Grant is awarded annually to a female non-traditional student who is interested in resuming her education after leaving school to fulfill either family or work-related responsibilities. Staton raises beef cattle, corn, wheat and alfalfa with her husband in Salt Lick, KY, and is a staff technologist and instructor for the Morehead State University Veterinary Technology Program. She is also a 4.0 student pursuing additional education herself, participating in MSU’s Education Technology Leadership EdD Program. Staton additionally volunteers her time and leadership skills to many industry, non-profit and civic organizations in the community. In her grant application, Staton stated that completing the additional education program will allow her to provide a better learning environment for her students and help her give students a solid educational foundation. With nearly 500,000 member families statewide, Kentucky Farm Bureau is the state’s largest general farm organization. Approximately 1,700 members attended KFB’s 93rd annual meeting, December 5-8, to recognize this year’s individual and organizational achievements as well as adopt policy for 2013.